Eggplant AI can run tests against your systems under test (SUTs) based on the model or models you build. In order for those models to interact with SUTs, you need to connect Eggplant AI to an instance of Eggplant Functional, then write SenseTalk code snippets in Eggplant Functional to perform the actions called for by the model. The agent creates the connection to an Eggplant Functional suite so that you can use SenseTalk code snippets to drive the actions of your Eggplant AI models. The agent can run on the same machine on which you run Eggplant AI, or on a hosted machine that you access remotely. The agent is available for both Windows and Mac, as well as in a raw Python version. For complete instructions on installing, configuring, and running the agent, see Configuring the Eggplant AI Agent. In order for a model to run tests on a SUT, that model must have a connection to the specific Eggplant Functional suite that contains the SenseTalk code snippets for its actions. Follow these steps to create a connection to a suite. Download and configure the Eggplant AI agent. Skip this step if your environment uses a hosted agent. Choose the agent you want to use from the Agent drop-down menu in the toolbar in Eggplant AI. This menu shows all agents available to any groups you belong to. The agents that appear in the drop-down menu might not be active; if the agent that you select is not active, the dot at the top of the Snippets tab will be red. If needed, adjust other options in the File > Settings dialog box. 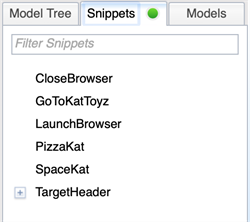 Select the Disable all snippets checkbox to temporarily disconnect the model from its suite so that you can run it without accessing the code snippets. This can be useful for debugging the model. If your information is entered correctly (agent name, suite path), and the agent is running, you should see a green light indicator on the Snippets tab in the left sidebar. Any scripts in the attached suite display on that tab. When no suite is connected, or if the agent isn't running, the indicator on the Snippets tab is red and no scripts show up. When you have an agent connection, you can use attach the code snippets in the connected suite to actions in your model. For information about adding snippets to actions, see Snippets Called by Action.